The Frankenstein. 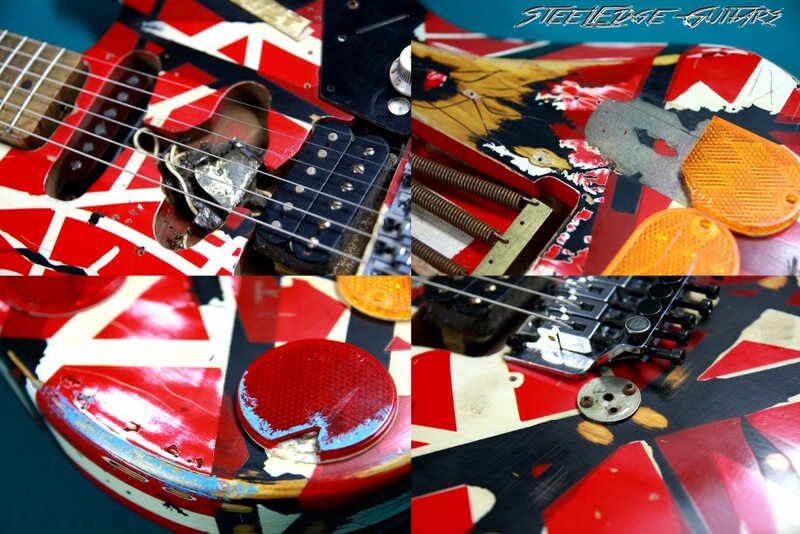 The red, white, and black stripped guitar. The most iconic and unique guitar EVER.With its own identity, this is the guitar that changed the history of the guitar and the way it was played and, in consequence, the history of rock. 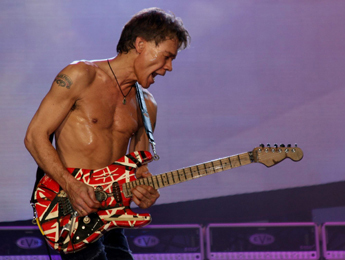 Along with Jimi Hendrix, Eddie Van Halen was the guy whose playing and style totally re-wrote the rules of the guitar playing. 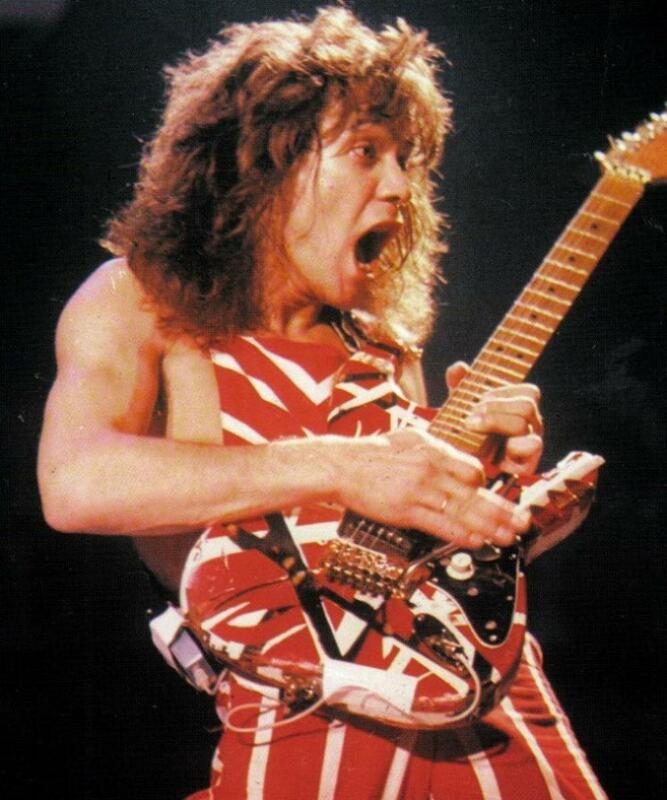 Eddie´s techniques, innovations and chops were the base for the modern rock guitar style. 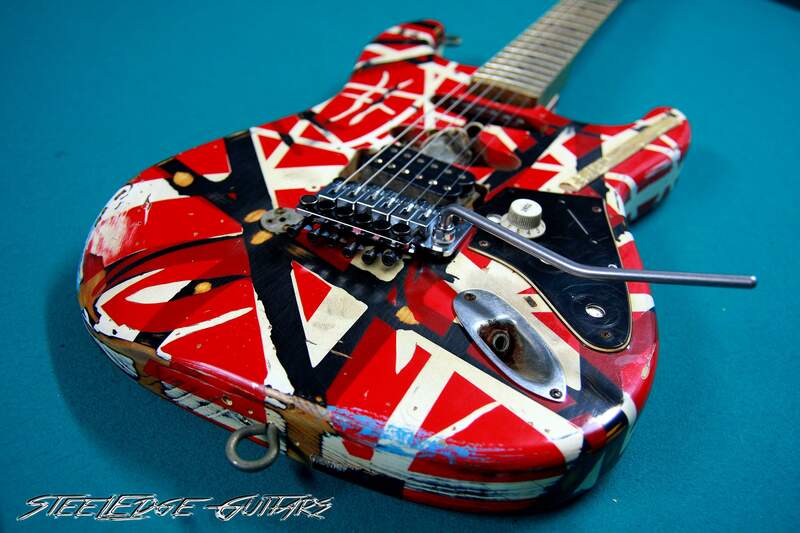 And this is the guitar that changed it all, truly a piece ROCK history. 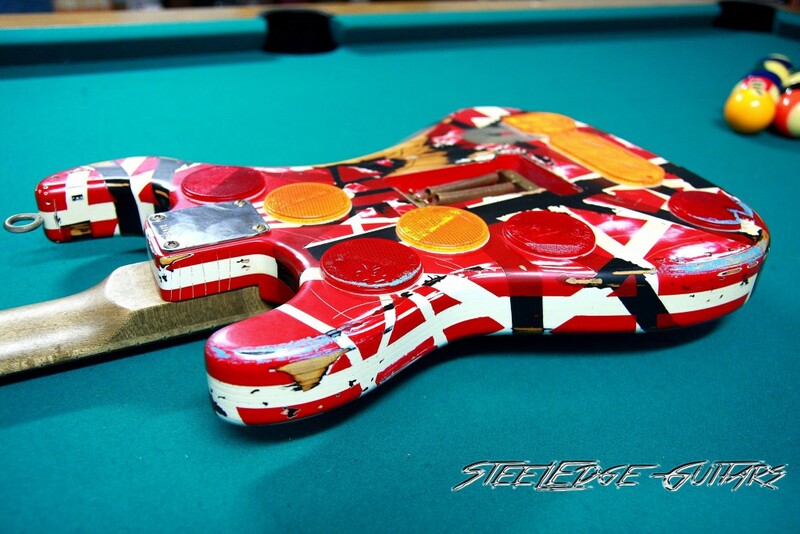 The Fender Custom Shop Eddie Van Halen Frankenstein replica is an amazing recreation of one of the most famous and recognized guitars in the world, the Frankenstein, the guitar that changed the rock and guitar playing history and one of the Holy Grails in guitar collection. 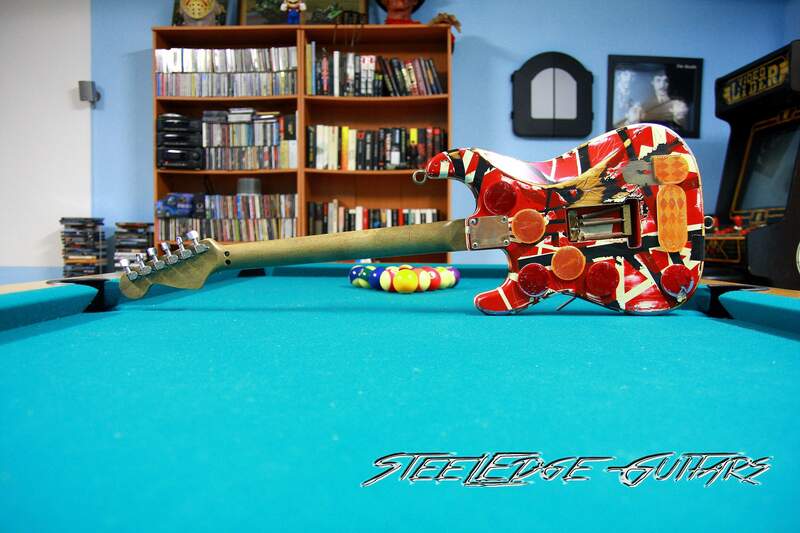 This is one of the Custom Shop Tributes / Original Reproductions (like the Clapton Blackie Tribute, the Andy Summers Telecaster or the Malmsteen Play Loud) most expected ever (and one of the most desirables! ), a guitar so original and different from all the others that it has its own identity, a guitar that is so recognizable that is an icon itself. Even the case is a piece of rock history, and the Frankenstein Replcia comes also with a very detailed reproduction of the Frankenstein Anvil case case with the Van Halen logo, scars, and also reliced. The story of the original Frankenstein is a cool tale to tell, from its origins in 1978 until how we know it as of today. 1978 was the year that the original Frankenstein was first seen by the world. 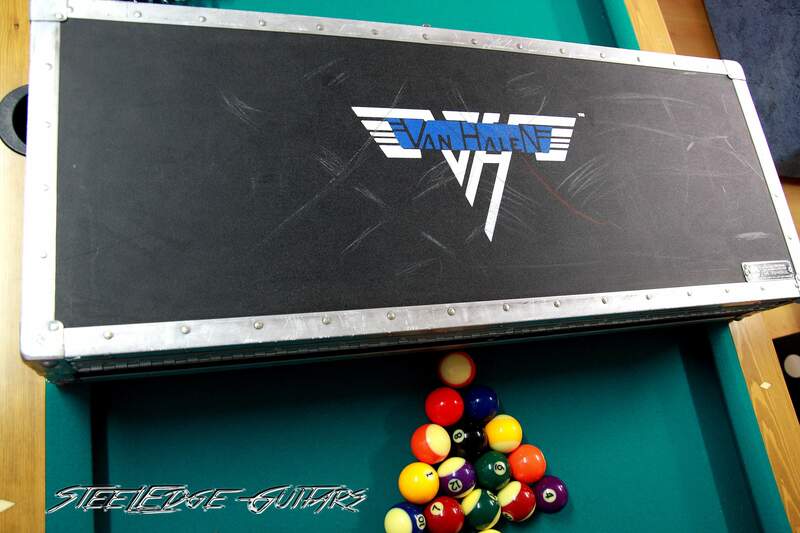 The Frankenstein made his first appearance pictured on Van Halen’s debut record. Looked familiar, but it was different, white and black stripped strat like. 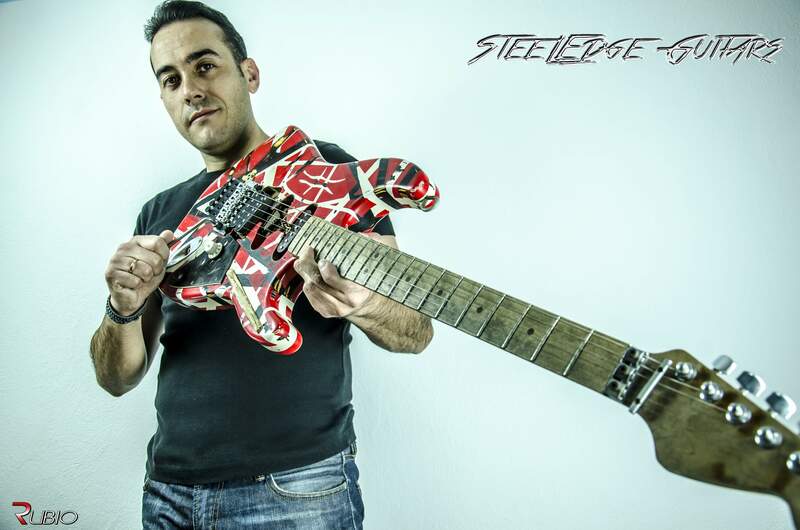 Eddie bought a Strat replacement body and a Strat replacement neck from Boogie Bodies, (Wayne Charvel´s shop). Eddie paid $50 for the body, and $80 for the neck. Eddie wanted the sound of a humbucker, so he found that the body wasn’t routed large enough to fit the Gibson PAF pickup he intended on installing, so he chunked wood away at the bridge position rout until it fit the PAF. Not a very “professional” job,but as the guitar was covered by a black, one pickup pickguard, the messy woodwork didn’t show. Ed removed all the tone controls also, opting to instead wire the pickup directly to one volume pot. The volume pot was famously topped by a white “Tone” knob. To finish the project, Ed found Schwinn bicycle paint in spray cans. He painted the body black, then wrapped masking tape randomly around the body and painted it white. 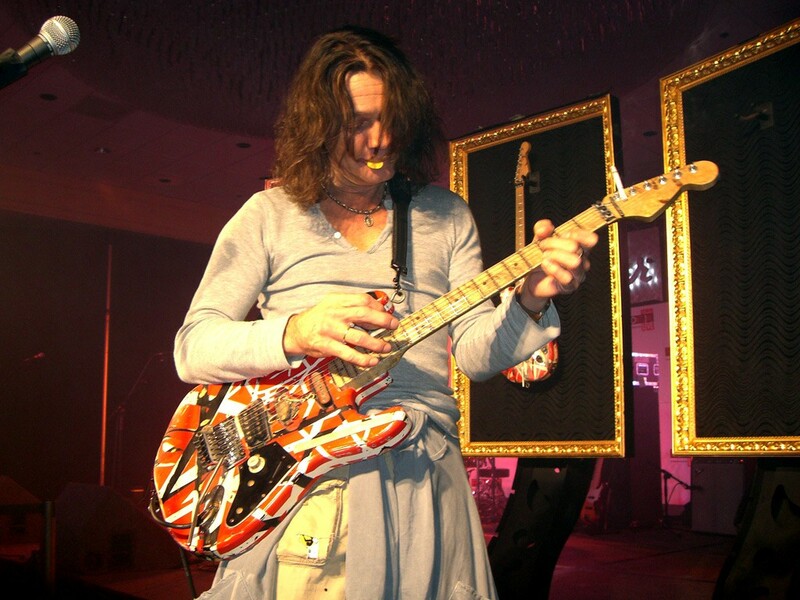 Once he removed the masking tape, he was left with the famous white and black strat that can be seen on the cover of Van Halen I. 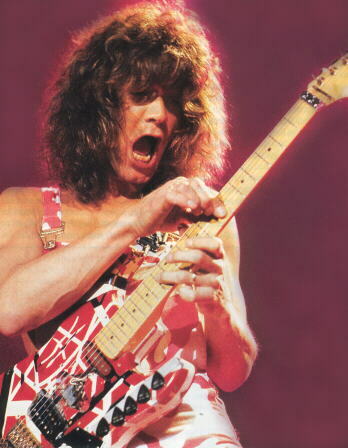 In 1979, Eddie was quickly becoming the most popular guitarist in the world, and copycats began to pop up. 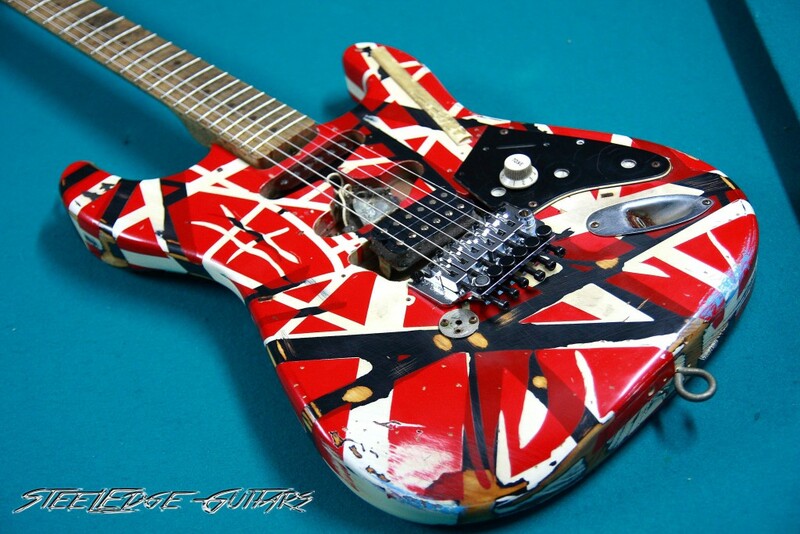 Ed noticed that everyone seemed to be painting their guitars white with black stripes, and even had to issue a cease and desist to a company that made guitars identical to the Frankenstein. To keep people from copying him and his style, Ed took his Frankenstein, by this time beat up, worn, with paint scratched off, and wrapped it again in more masking tape. He then sprayed a few coats of Schwinn red paint, giving us what we now know as the red, white, and black guitar striping. 1979 also saw Ed putting a white pickguard on the guitar, as well as putting a second pickup in the guitar, a Mighty Mite single coil in phenolic red. 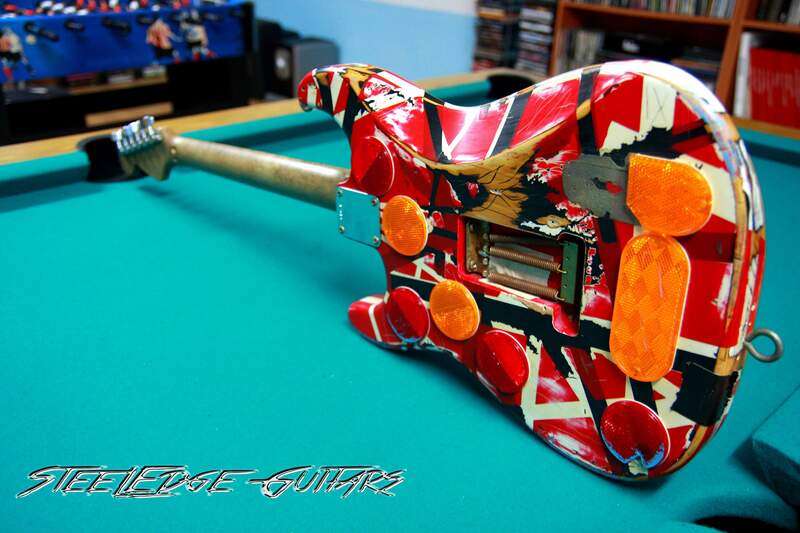 Unfortunately, Ed didn’t know how to wire it up, so it ended up being a decorative mod, and a way of tricking people who wanted to know about his tone and pick up configuration. Ed also added truck reflectors to the back of the guitar, which shone brightly during live shows. 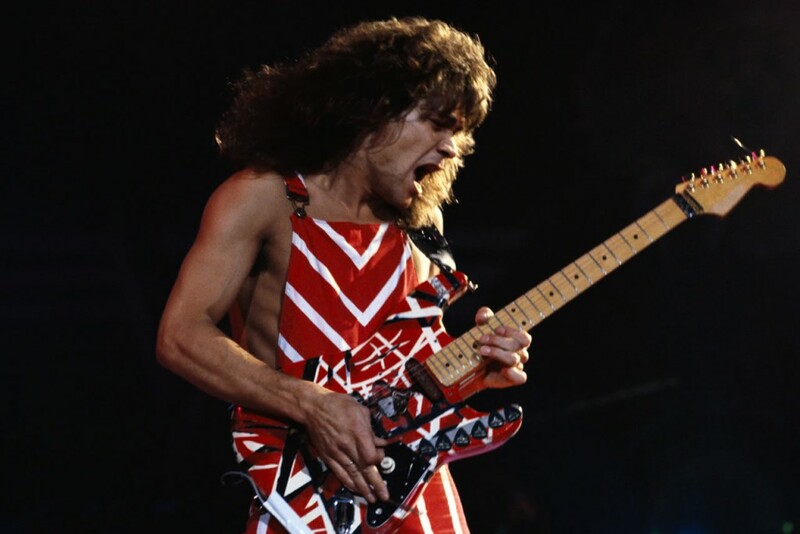 In 1980 Eddie added the Floyd Rose, with was a new invention by the time. He also found out that the pickup was microphonic from the coils rattling around, so he hand-dipped the pickups in pure paraffin wax, a technique that is used today by all the major pickup manufacturers. In 1981 the PAF went back to black in color. 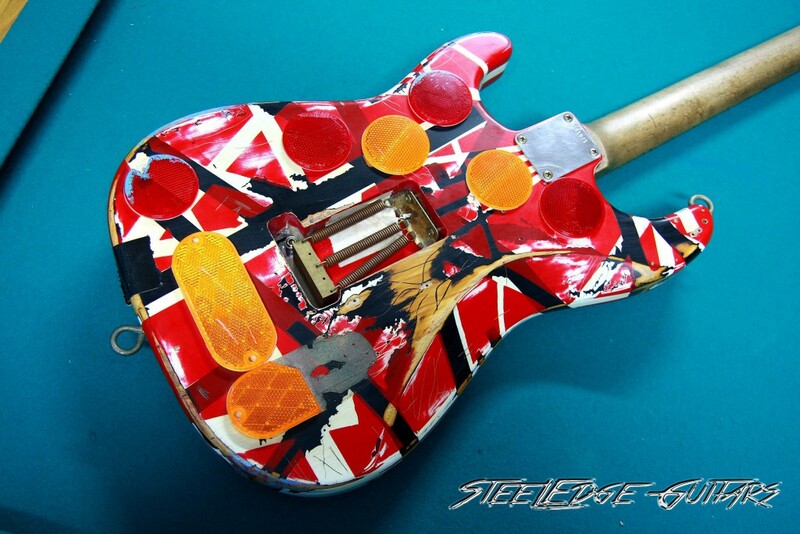 The vinyl record was replaced by a proper pickguard, but in true EVH style, it was trimmed down to only cover the control cavity. A three-way switch was screwed into the middle pickup rout, but just like the neck Mighty Mite single coil, it ended up only being decorative.Ed just couldn’t find a way to wire them all together, so the bridge PAF pickup remained wired directly to the volume pot. 1981 is also the first time the quarter appeared. Ed couldn’t get the Floyd to intone correctly after dive-bombing, as there was a small gap on the bass side. 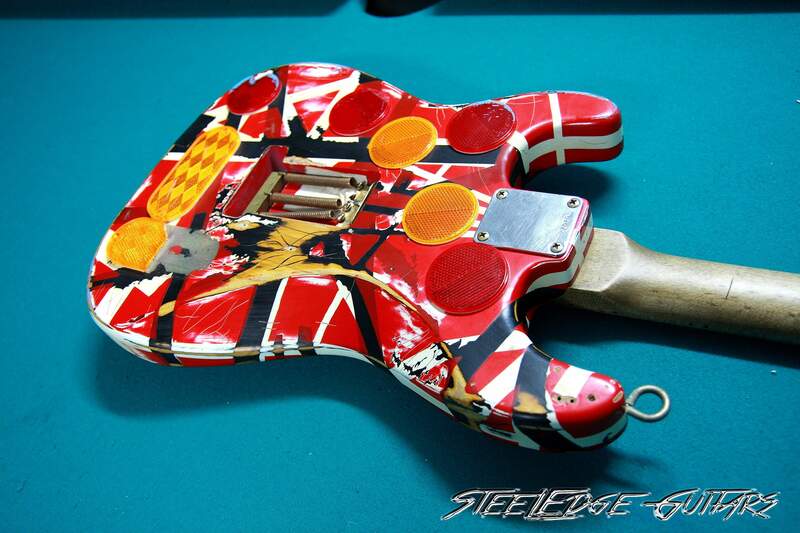 Ed screwed down a 1971 quarter to the guitar body, which shimmed the gap between the body and the bridge. Although it didn’t take long to build, and although the whole thing cost him less than $150, this was the guitar that would change the world. 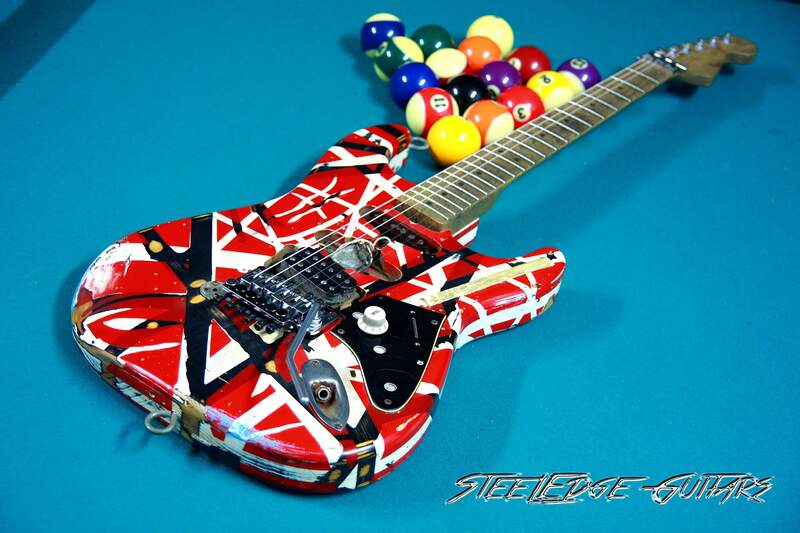 It became Van Halen’s main instrument for the first several albums and tours.Fans loved the guitar and what he did with it. They even gave it a nickname–”Frankenstein” But to Eddie, it was simply “My baby”. 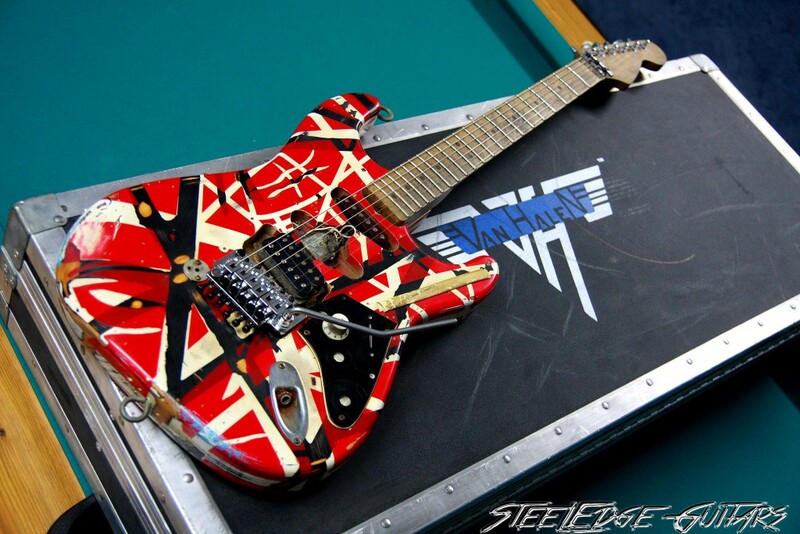 In 2007, Fender joined forces with Eddie Van Halen to build a perfect replica of the original Frankenstein, reproducing every detail and matching the sound and feeling of the original. They released a limited edition of 300 pieces priced at $25.000 each one. This is not a guitar for every pocket, but as a collector, it is for sure a pride to own, and for any guitar player, a pleasure to play. Strikingly accurate down to the very last detail, aged and reliced to look exactly the same than the original (Even Eddie Van Halen said he couldn´t difference the original from the replica, except because the replica played better than the original, you can see it in some of the Frankenstein videos), this limited edition of 300 pieces is for sure one of the most sought after and desirables guitars money can buy. 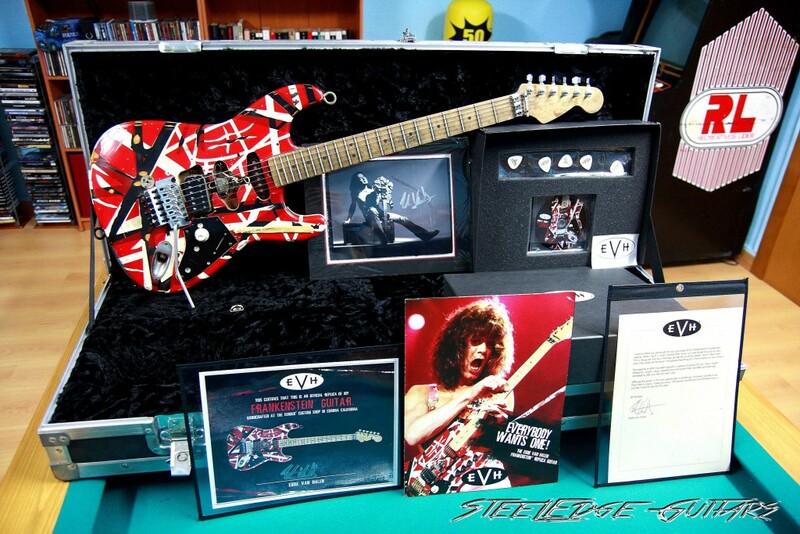 The Frankenstein comes with an exact reproduction of Eddie´s Anvil Hardshell Case with the Van Halen logo painted on it, and a lot of case candy memorabilia in a cool Black Box with the EVH logo on it that includes: A Certificate of Authenticity signed by Eddie and Fender, a acknowledgement letter from Eddie himself, a cool picture of Eddie with the Frankenstein hand signed by the man himself, a CD with Eddie talking about the Frankenstein and the replica, the making of and video footage of the Frankenstein, 5 EVH collectible pics and an EVH sticker. Also, I managed myself to get one of the original EVH Frankenstein Fender brochures, which is a very cool folded poster with a lot of info and characteristics of the Fender Frankenstein. 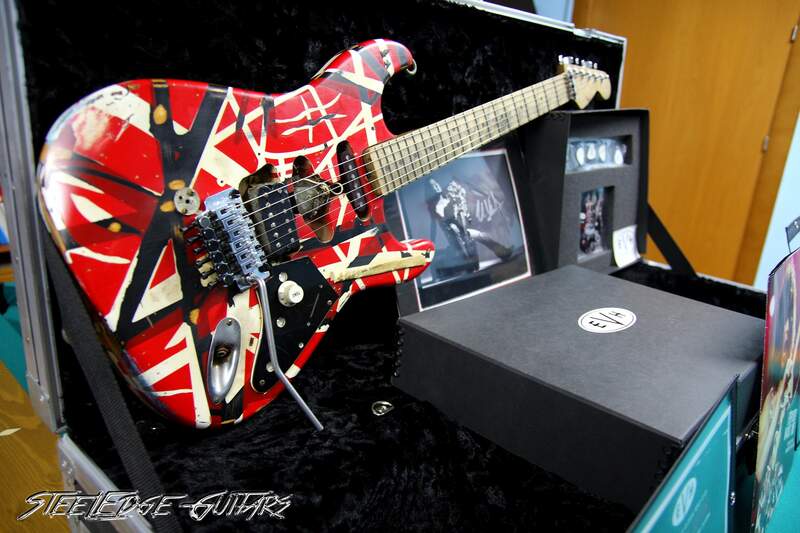 The Frankenstein is just an instant mind blowing guitar in the same moment you open the case and look at it. 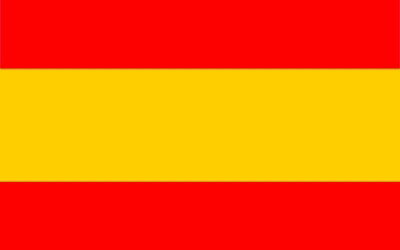 The look, the colors, the iconic images it brings to your head… is like if you were contemplating some kind of Rock´s Ark of the Covenant. The amount of details is just overwhelming, the scratchs, the paint, the rusty parts, the cool 1971 quarter… here you can see how many details the guitar shows. And here you can also see the quality of the wood, the scratches, the grain of the birdseye maple neck… the quality s just outstanding. 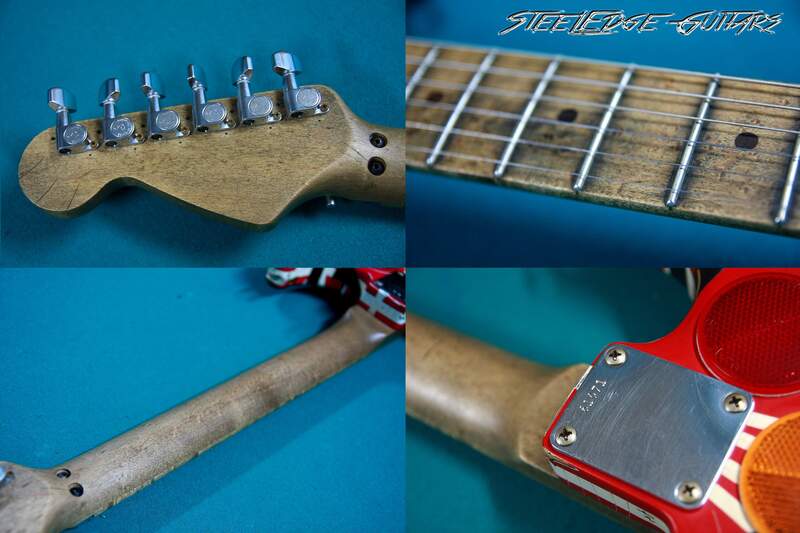 The neck is made from very beautiful Birdseye maple, and feels very comfortable as it has been worn off, like played for thousand of timed, so is smooth and nice to the hand, it has been aged and dirtied to look exactly as Eddie´s original. The body is made of very high quality premium ash, very light weight (the guitar was less than 3,5kg in my digital bascule), and comes with the dummy phenol red neck pickup (unwired, just for tricking Eddie´s tone imitators 😉 ), the pickup selector switch in the middle (another Eddie´s trick to avoid copycats) and the amazing EVH Frankenstein pickup in the bridge, where all the sound comes from. This pick up was made specifically for this guitar, and though later another Frankenstein pickup was made and commercialized from Seymour Duncan, is not exactly the same model than this one, believe me…of course, the pickup has been aged and reliced, along with all the other components. Even the 1971 quarter is there, acting like a trem stopper, shimmering the gap between the body and the bridge that the original had. The broken pickguard, the “tone” knob which acts as a volume knob, the strip of double-sided masking tape served as pick holder… just like the original. Even some “tar” or something in the upper horn is there. 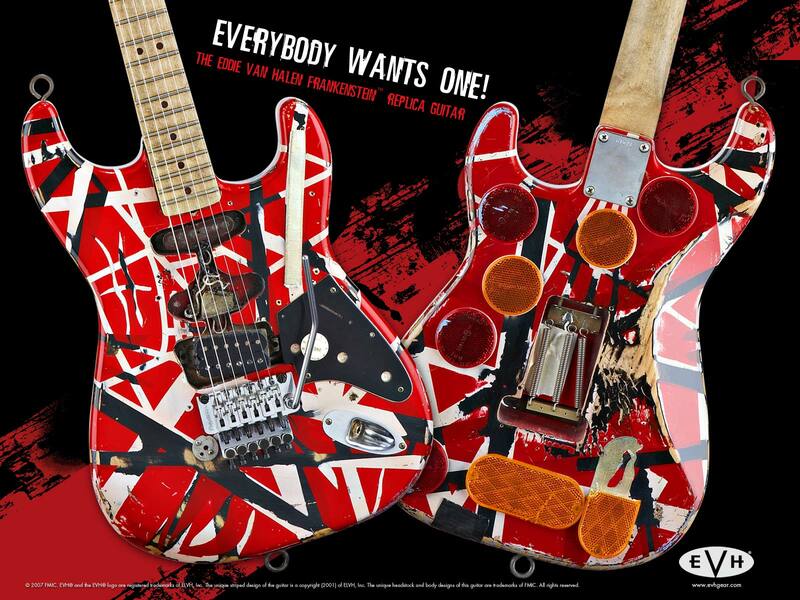 You can see in some videos how reviewers and people who was involved with the guitar production say that no one could difference the original from the replica from a close distance, and that even Eddie´s couldn´t difference at first sight. The back of the guitar is also awesome, with all the added truck reflectors, the original 61071 serial neck plate, the exactly position of the springs in the Floyd rose, the famous blue paint from a Van Halen banner where Eddie swiped the guitar, the eye bolt strap buttons along with some holes where the eye bolt were previously screwed, the duct tape…. The guitar has SO MANY details that you always discover something new when looking close to it. Once you plug it…be prepared to rock, because this guitar has the ROCK TONE, plug it to an EVH 5150 or a good Marshall Plexi (or any modern rock sounding amp) and be prepared to be amazed with the brown tone.All the harmonics, all the power, all the tone that you have in your head from listening to the EVH record is there, from the intro of “Chains” to the “Ain´t Talking ´Bout Love” riff, and going to the shredding passages of Eruption. 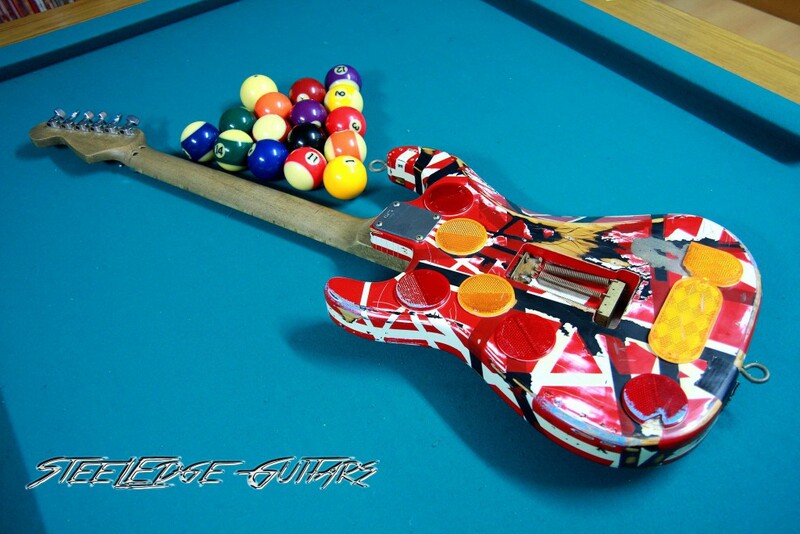 Yes, you are in rock´n ´roll heaven, enjoy! 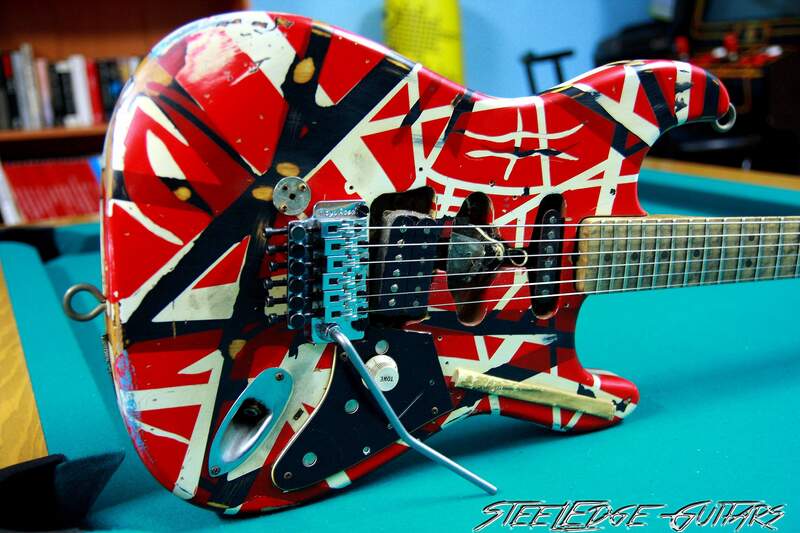 I can´t talk very much about versatility on this guitar, but if you have paid $25.000 for this axe, versatility is not probably what you are looking for, you are looking for the EVH tone, the Brown Sound, and this guitar for sure has it. And it also has the looks! Anyway, you can get a full variety of tones here, bluesy cleans, rocking crunchs, amazing leads with harmonics anywhere…. 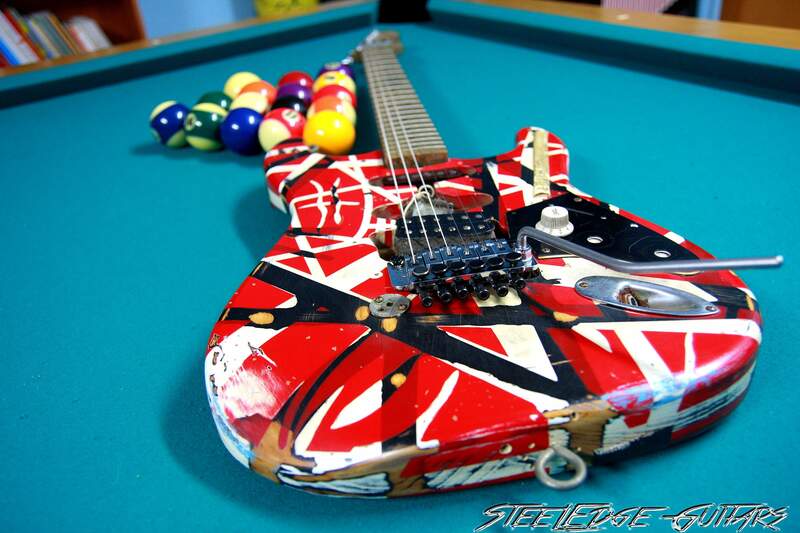 but don´t look for multiple pickups / push-pull / boosters / tone knobs electronics, this is not the guitar. The guitar has beautiful cleans and the volume pot can make the guitar sound very different, but when you play it with some good distortion at full volume, you know that rock sound can´t get any better than what you are hearing. You can get easily the “bluesy” tones with low volume, the rock crunch at medium volume and all the harmonics and powerful brown lead sound with all volume up. 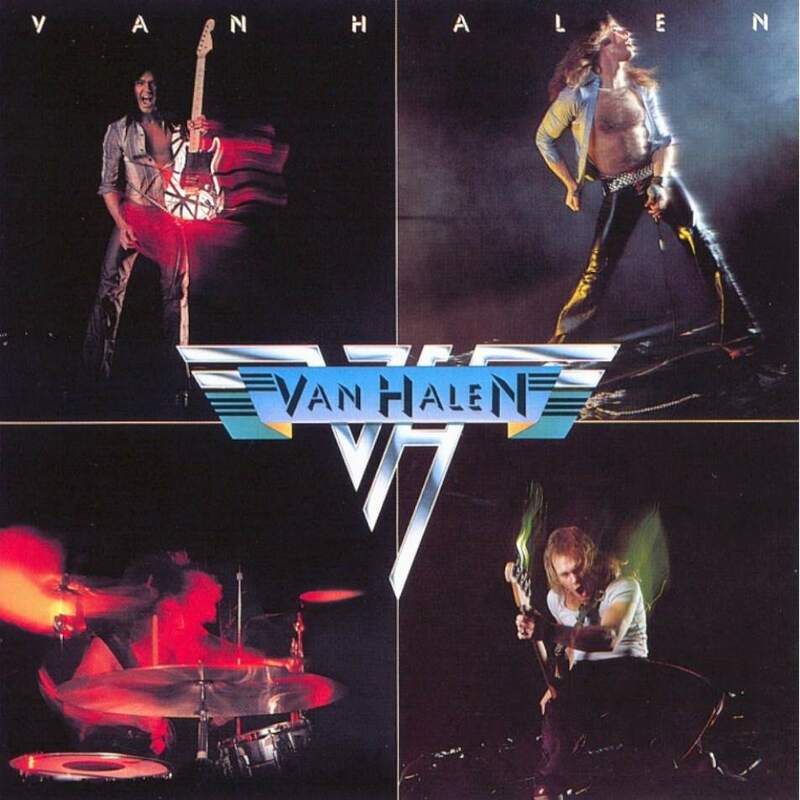 Play the Chains intro, the Ain´t Talking Bout Love arpeggio, the cool Panama intro riff or the mind blowing You Got Me Going powerfull riff and you´ll feel that the Eddie Van Halen tone is very very near of your hands. 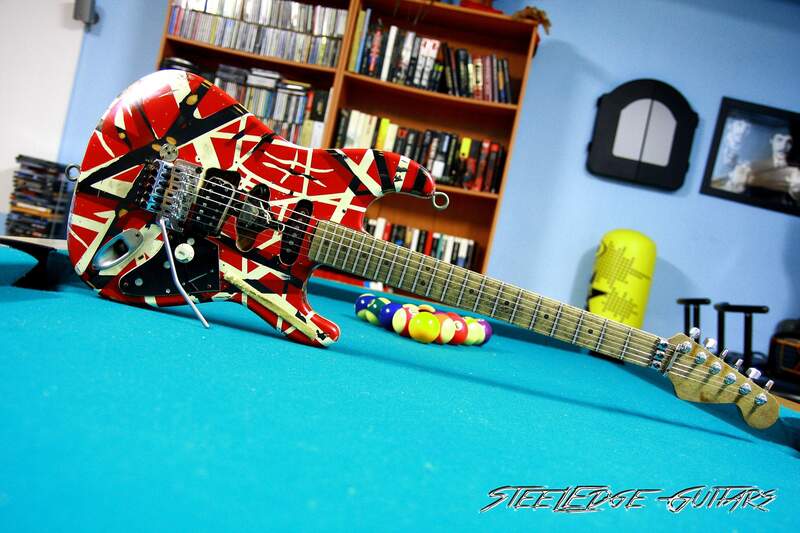 I always dreamed with owning this guitar when I was a kid (the original one, of course! ), I was a totally Satriani fan, but Eddie Van Halen was with no doubts one of my guitar heroes, and that guitar was SO COOL!!!. When I saw that Fender realeased this Limited Edition, I totally freaked out… but the price tag was at the moment too much for me. I always looked to the ones that popped up time to time on eBay or forums, and also managed myself to get a non-official replica… but as a collector, the Fender edition was like a pinnacle to me, and, after some years, I got the opportunity of getting one of the few that came to Spain thru a friend who told me that a store was closing and the owner was selling a new old stock Frankenstein… was too much money for me at the time, so I passed and another guy got it… but couple of years after that, I have the opportunity of buying that same guitar at a very good price from that guy and I couldn´t say no, though I had to sacrifice some pieces of my own collection to collect the money for the purchase. Little after that, one of the best collectors in Spain, who is a good friend of mine, decided to sell his guitar collection .I had sold some of my finest guitars to him in the past and he offered get them back, and also offered some other pieces of his collection in a package if I bought several guitars. 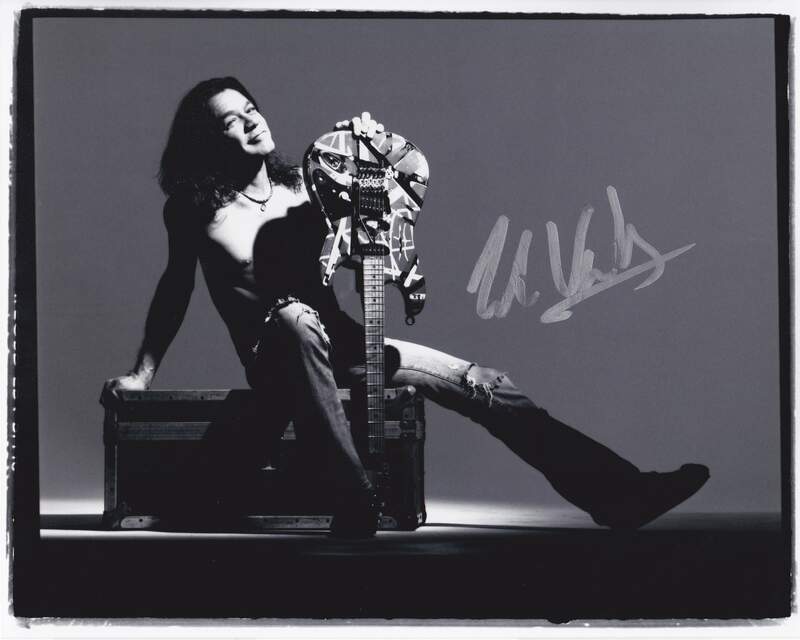 I got a lot of special guitars from him (took all my savings.ALL!) but I thought it was a good investment, as far as the deals were very good and my friend totally trustable, so, I got another Fender Eddie Van Halen Frankenstein from him, which he had bought new from the store, cardbox sealed. He is a keyboard player (also a collector of synthesizers) and barely plays guitar, so the guitar was 100% new, factory strings on it, he even didn´t played it, just hanged in the wall with the others guitar for visual pleasure. So, I was fortunately enough to own two of these beauties at the same time (you know, collector´s madness…). They both were pretty similar, just little little differences in millimeters in the stripes patterns, the dirty on the neck… very subtle. In sound and feeling, they were exactly the same. After owning both thinking about keeping one as collector’s item inside it box and enjoy the other one, I understood that having two same $25.000 guitars was out of my possibilities and out of sense, so, I sold the played one (just hours of playing, 2 at maximum) which had the case candy box opened to a friend of mine (really cheap!) which is a well known collector / dealer and kept the case queen collectors condition unopened goodies one for myself. I thought of keeping it as an investment in totally new collector´s condition, sealed goodies box, etching was even afraid of playing it as new as it was and lose value, it was more an investment than an instrument, so, at a determinate point, I decided to sell as I wasn´t really enjoying or playing it, and the guitar went to a very good friend of mine in France, who know takes care and babies that beauty. Just a minute after shipping the guitar to France, I knew I had made a mistake. 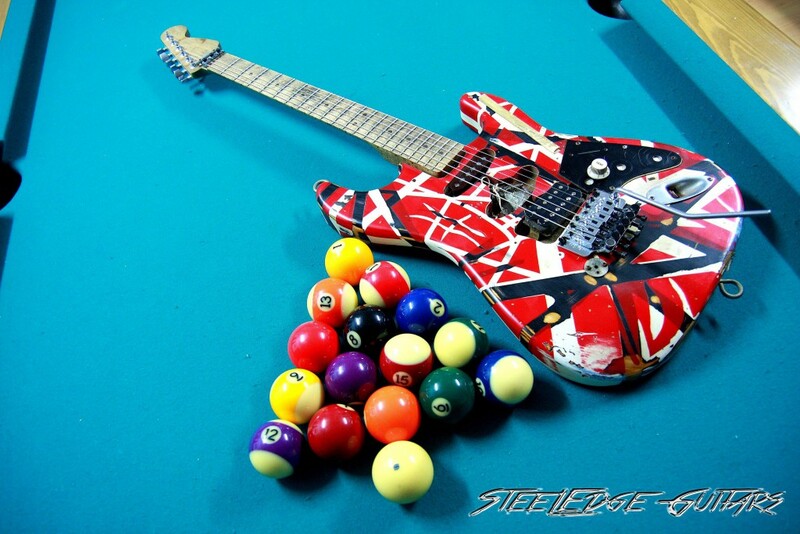 I felt totally devastated, as a guitar collector and as a guitar player (not to mention as a Van Halen fan) this is a guitar I HAD to own …but now was gone. I quickly talked to my friend, the actual the owner of the first Fender Frankenstein I sold and asked him to sell it back to me. 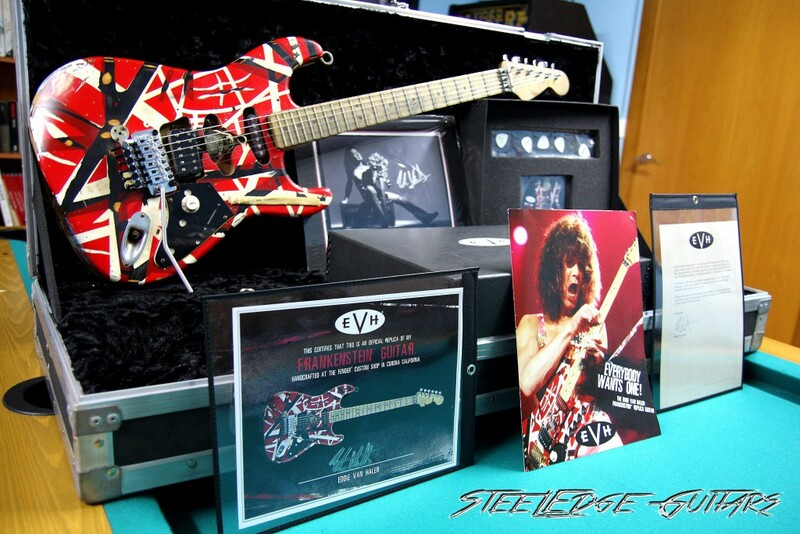 Well, it took some more money than I sold it to him in the first time (totally understandable, as he is a dealer and I know he rejected way better offers for it than for what he sold it back to me) but I finally got the EVH Frankenstein back to my collection. Now that I have it in my hands again, I know how much this guitar means to me and how cool is to own this guitar. I enjoy this guitar just looking at it, is one of the queens in my collection, and when I have a hard day or even things are not going the way are supposed to be, I remember of this amazing guitar awaiting for me to play it and I feel way better, really. Is a piece of happiness for me, a guitar that means something more beyond material possessions to me ….